again to pick each little moment and cut apart. There is win potential here but the trailer itself does not do a good job of selling the movie to me. On the one hand it has a nice look to it, a good updated aesthetic so it doesn't feel like complete retread of old 80's looks. On the other if you pay attention to how the cuts are placed it's only telling you fragments that are spliced together instead of actual lengthy exposition chunks. I've been ignoring this one since it's been in development hell for a few years. Murphy gets injured/maimed in a car bombing instead of over-the top gunfire. At first I wasn't sure on this because the whole point of him getting gunned down was just to be so gratuitously over the top that it turns into dark comedy. Then I got to thinking what've we been conditioned about again and again and again for the past decade and change? Congratulations we have social/class issues mixed with terrorism being the key motivators here instead of the crimewave from hell that was the big fear of the 80's. Next up is the trailer presenting Murphy apparently waking up and self-aware right from the get-go. This could be a case where we see a thing and then an important bit is cut right after. Example being it could be right after his little episode his memory gets wiped or suppressed. On the same matter it shows Murphy in-suit interacting with his wife and son which can be a callback of sorts to a part of Robocop 2 where Murphy is directed by OCP to directly tell his wife that he is not her husband. Last on my to-poke-at list is the fact Murphy has a non-artificial right hand. 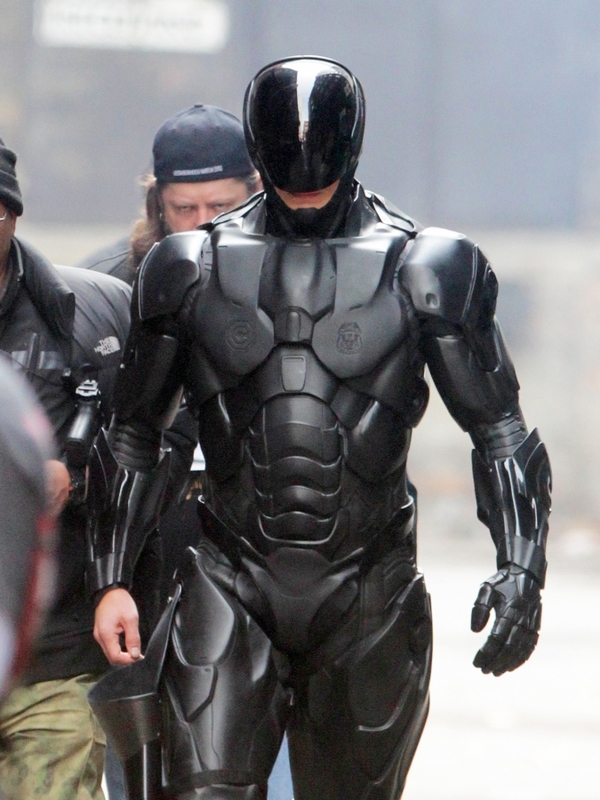 From what I can tell the big thing is that Robocop is a huge PR thing more so than anything else. I could see it playing out, since it's shown in trailer that there are humanoid fully autonomous units, that Alex will serve as the template all the rest learn from As people get used to and supportive of Robocop a Phase 2 would be them slowly rolling out these human drones 'modeled after and have learned from real human beings.' It could be this is where the 'he thinks he's in control' part comes in. It being sold that Murphy has control of these drones to act as oversight and then the second half of the movie shows that was just publicity and mirrors and worse they have a cut-out on his hardware. There is potential here for lots of satire and social commentary along with the big kabooms. I'm not completely sold on the concept, but keep in mind the trailer was spliced, and cut, and poked to send a very 'man vs machine' message. As much as it's made to look like a bland bit of hollywood sterile packaging I want to believe the director, cast, and crew were all fans of the original who want to make it both pay respect to where it came from, and also do enough original to make it so I won't feel, as a customer, I could've just gotten a bargain bin dvd or watch it on netflix instead of go to the theatre. Look at Tron Legacy. No really look at it. Sure it's not a remake but it's another 80's film that got changed around to fit a more modern look. It did everything right from having a director that was also an architect (meaning all the set pieces even in the digital bits had a 'this could exist and have purpose' feel,) to a cast and crew that very much bought into how the original had influenced a generation of film-makers. You can do an update to something twenty or thirty years old and not lose what made it good. Trailers spoil. Trailers lie. Trailers can be cut to make a film awesome or horrible or any number of things. There's a whole cottage industry of youtube fan trailers that make films out to be things they aren't; ranging from Matrix turned love story to The Shining as a family film. We simply do not have enough information to go on and there's a vocal segment of fans that would rather see nothing new made than hollywood try and fumble. Sure I'd like to see more original pieces, but the producers, studios, and other money holders are more likely to go with material that is a known sell rather than an unknown potential money sink.